In 1939, the families in a remote Jewish village in Romania feel the war close in on them. Their tribe has moved and escaped for thousands of years- across oceans, deserts, and mountains-but now, it seems, there is nowhere else to go. Danger is imminent in every direction, yet the territory of imagination and belief is limitless. At the suggestion of an eleven-year-old girl and a mysterious stranger who has washed up on the riverbank, the villagers decide to reinvent the world: deny any relationship with the known and start over from scratch. Destiny is unwritten. Time and history are forgotten. Jobs, husbands, a child, are reassigned. And for years, there is boundless hope. But the real world continues to unfold alongside the imagined one, eventually overtaking it, and soon our narrator-the girl, grown into a young mother-must flee her village, move from one world to the next, to find her husband and save her children, and propel them toward a real and hopeful future. 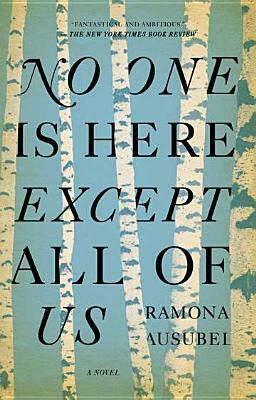 A beguiling, imaginative, inspiring story about the bigness of being alive as an individual, as a member of a tribe, and as a participant in history, No One Is Here Except All Of Us explores how we use storytelling to survive and shape our own truths. It marks the arrival of a major new literary talent. Ramona Ausubel is a graduate of the MFA program at the University of California, Irvine. She is the author of Awayland, Sons and Daughters of Ease and Plenty, and No One Is Here Except All of Us. Her work has been published in The New Yorker, One Story, The Paris Review Daily, Best American Fantasy, and elsewhere, and has received special mentions in The Best American Short Stories and The Best American Nonrequired Reading. She has been longlisted for The Frank O'Connor Short Story Prize, and a finalist for the New York Public Library Young Lions award and the Pushcart Prize. In the opening of the novel, Lena tells Chaya in her letter, “Maybe, when the world began, everything had been clean and pure.” When the villagers start their world over, does the world begin “clean and pure,” or are the seeds of its destruction built into its founding? When the villagers start their world over, they begin with storytelling. What importance does storytelling have for the novel? What is its power? How does each of the characters employ storytelling? What do these uses tell you about each character? One of the bonds that is the most transient in the novel is that between parent and child. How does the author depict this bond? Consider the situations in which children are transferred in the novel: were the parents right to let their children be adopted by others? What do you think about the motivations of the adoptive parents? What is the stranger’s role in the re-creation of the world? Could the villagers have done it without her? Why does she decide to help protect the village from the outside world? What eventually makes her allow it back in? Igor is the only character who is captured, yet his imprisonment ends up ensuring his safety, while the characters who remain “free” must fight for their own survival. What does this say about the concept of freedom? In this novel, is personal choice a gift or a burden, or both? With the reinvention of the world, time is upended. Lena is made to grow up at an unusual rate. Does she really age faster? Do you think she and the other villagers realize the truth but allow Hersh and Kayla to believe their own story? What about when Lena gets married and bears a child—has the story about her aging process had a real and actual effect? How does Lena know what happens to the other characters? Given the role that imagination and storytelling play in the novel, does it matter whether Lena has outside information? Would that make her version any more or less true? Many unfair things happen to Lena during the course of the book-her parents’ giving her away, her losing her sons, and so on. How does she cope? Does she forgive the other characters? What role does forgiveness play in the novel? What do you think the title No One is Here Except All of Us means? At the end of the book, Lena writes to Chaya, “Someday, your children will ask what happened, and you will tell a new version, and in this way, the story will keep living. Truth is not in facts. The truth is in the telling.” What does Lena mean by this? Is there a difference between truth and accuracy?